There are lots of new ways to talk about monetizing digital signage. Not too long ago, in the primordial phases of digital signage, many focused on impossible-to-measure delivery of “impressions,” but as it turns out, the ROI on dynamic displays is quite nuanced. Marketing has evolved to encompass a number of “engagement” tactics, and they don’t all have instant results. Sometimes you’re building a brand, and the uptick in sales will take time. Or in the case of higher education or enterprise, sometimes the goal is to create a positive impression or boost productivity over the long term. But for those who need to see instant results, digital signage also offers proximity marketing and on-screen order taking to boost sales. So it turns out that digital signage content doesn’t have to be all about “Half Off” and “For a Limited Time Only," and it doesn’t even have to “promote umbrellas when it starts raining outside.” Ideally, in the current marketing climate of “customer engagement” and “creating brand intimacy,” it’s more important to use cool video technology to create a remarkable impression—you know, like video was meant to do! Think robots, think interactivity, think multi-touch, because no one wants to walk up to an inviting screen and find that it doesn’t do anything when you touch it. “Aim to mesmerize, not monetize.” Builder of “smart spaces” to enhance branding, David also emphasized “creating authentic engagement with a brand.” That means it’s time to think beyond the same old 16:9 rectangle and aim for wall-wrapping, mind-bending projection mapping or tiled video wall configurations. 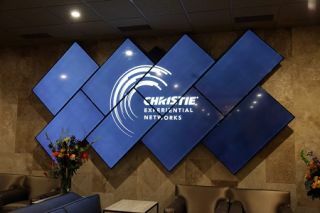 If you’ve seen the Christie Digital booth at InfoComm, you know what I’m talking about. Corridors are opportunities for excitement. Think about stadiums, airports, parking garages, and maybe even that old dinosaur of an experience, the shopping mall. There’s a lot of walking (or hoverboarding) that happens in those spaces, and a few have even added some nice light and music shows to accompany the journey. Maybe it’s time you transformed an empty wall into something worth looking at. That’s what the good people at UNLV did with the “Rebel Rec” Student Recreation and Wellness Center. The school bought itself some serious engagement with a new Planar Clarity Matrix LCD video wall system. That’s certainly a captive audience that’s leaving with a positive impression. Wait, do you have a room full of people in a meeting scheduled to end at a certain time? Do you have something to sell in a coffee shop, copy center, local restaurant, or maybe a yoga studio and meditation center for blowing off steam? Well, MGM Resorts has an idea for you: meeting room signage, paired with BLE beacon technology, to use the power of digital persuasion. Tap into that revenue stream and maybe make conferences more fun in the meantime. Do you work at a company, university, museum, or anywhere that purports to have a “contemporary” image? Maybe it’s time to use digital signage for more than lunch menus and RSS news feeds. And maybe the content should move beyond video walls and flat panel displays to the direct line of sight of people working within a space. It’s time to usher in the new level of the “connected desktop.” Study up on X2O Media’s new enterprise-evolving X2O.Join technology and turn those desktop displays into an enterprise-wide visual communication network. It might even be possible to pull people away from social media feeds and get them to look at dashboards showing key business metrics, if they’re delivered in real time in a dynamic way. The technology also allows for sharing employee surveys, video from events like town hall meetings, and important live announcements such as emergency notifications. Everyone got all excited when Apple legitimized the Bluetooth Low Energy (BLE) location beacon idea with the release of its iBeacon proximity messaging system last year. Suddenly, dreams of “proximity marketing” were coming true, and it was possible to beam enticing menu options or specials directly to consumers’ mobile devices as they passed through a geographical bubble around a business or inside of a store. But naturally that led to the follow-up question of how to use BLE beacons, which also exist in the Android landscape. Fortunately, digital signage manufacturers were already on the case, and now it’s possible to add some hardware to activate some software in the cloud, et voila, we have proximity marketing. Samsung is on it, even bringing the ever-so-appealing “Internet of Things” into the equation. The screen manufacturer recently partnered with Zebra Technologies on a proximity marketing test run, embedding RFID tags into wine bottle labels and connected them to digital signs, prompting relevant customer reviews and food pairings to appear on screens when customers pass by with a tagged bottle of wine. Seen in action by this intrepid reporter most recently in a fast-food joint in the south of France, it turns out that when you put an interactive digital sign into a restaurant, people order from it, even when there are human order takers present. (Even in the south of France!) Frequently, in watching this process happen over and over again, it appears as though they order more than they usually would, lingering over their selections without the embarrassment of having to say their order out loud. Kirsten Nelson is SCN's Editor at Large.